Encore’s global connections are expanding and deepening, with Network members in 14 countries and regular connections among our programs. Check out our new global page for profiles and news from those programs. Through our global connections we collaborate with organizations and individuals around the world who view longer lives as an opportunity for our countries. 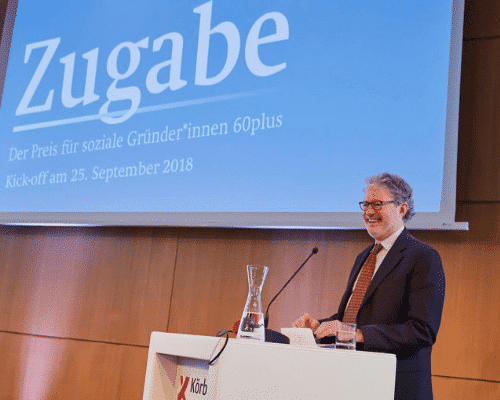 So, in September we were delighted to support Germany’s Körber Foundation as they launched the Zugabe (“encore” in German) Social Entrepreneurship Prize. Encore and the Körber Foundation have been close collaborators for a number of years and the Körber team (Susanne Kutz, Karin Haist and Caroline Oxley) were thrilled to have Encore.org founder, Marc Freedman, in Hamburg to support the launch. He spoke about the aging opportunity and how we can make the most of the longevity revolution. He also spoke about the history of Encore.org’s Purpose Prize, on which the Zugabe Prize is modeled. The Prize should “set an example that it is never too late to take on social responsibility,” explained Susanne Kutz, director of the Department of Age and Demography of the Körber Foundation. In doing so, the Foundation follows the example of its founder, Kurt A. Körber, who was particularly interested in meaningful action for good aging. The launch kicks off a nomination process to identify social impact pioneers of 60+ for the Zugabe Prize. Ten finalists will be identified by April 2019 and three will be awarded 60,000 euros in June 2019. The launch brought together over 80 German social impact representatives, demographers, business professionals, academics, policymakers and civil society experts. To support the launch, the Körber Foundation introduced findings from a survey on the social potential of the 50 to 75 year-olds in Germany. The data shows that people over the age of 50 are interested in socially relevant topics and are willing to start new programs. And, as Susanne Kutz said, they have the skills to found organizations: life experience, subject matter expertise, skills and time. But role models – like those who will be recognized through the Zugabe Prize – are needed. We will follow the progress of the Prize closely and look forward to hearing about the awards in 2019.